A CONTROVERSIAL neo-Nazi music festival will be held in Brisbane this year, drawing white supremacists from around the world. 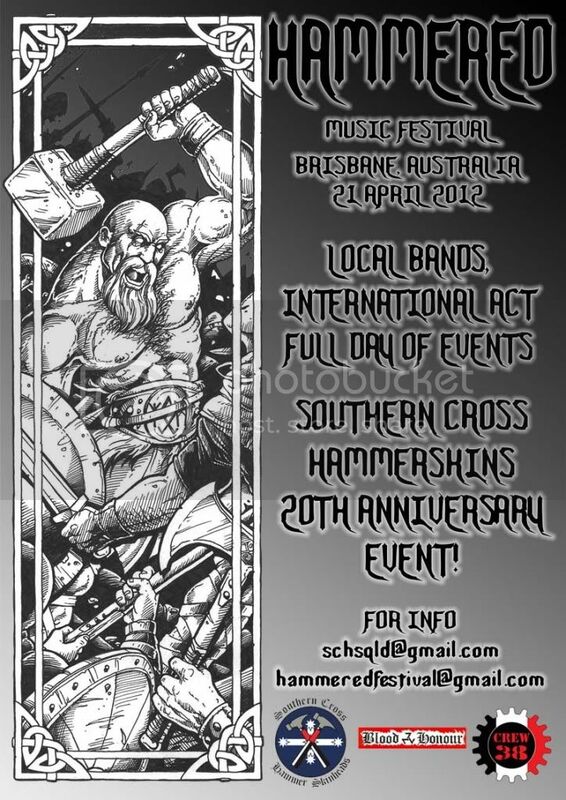 The controversial Hammered Music Festival, already being advertised through white pride websites, will take place in a secret Brisbane location in April and feature race hate music from international and local bands. The white pride gathering attracted protests and nationwide criticism last year when it was held on the Gold Coast, and a range of groups have already spoken out against the event. Federal Race Discrimination Commissioner Dr Helen Szoke this week slammed the white pride festival as "abhorrent to our community", and said offended parties could complain under the Racial Discrimination Act. "The theme of this music festival goes against Australia's multicultural values," Dr Szoke said. Federation of Ethnic Communities' Councils of Australia chairman Pino Migliorino said the festival was the work of a "lunatic fringe" and he was concerned about the underlying message of the festival. "It's an appalling set of beliefs that they have," he said. "The reality is a great majority of Australians are not racist and are comfortable with cultural and linguistic diversity." The event is being organised by the Southern Cross Hammerskins, the Australian arm of a worldwide group. Another organiser, Blood and Honour, was banned in Germany in 2000 after a number of foreigners were attacked by neo-nazis inspired by music at the group's events. But Queensland Police Service and the Brisbane City Council have said the groups can legally hold the event. A QPS spokesman said as long as the groups and the festival-goers abided by the law, the police would not become involved. "Police are aware of the festival in question. However, until such a time that a law is broken or a complaint is made, it is not a police issue," he said. Deputy Mayor Adrian Schrinner said the Gold Coast City Council reported no problems when the event was held there, and the group had the same rights as any other organisation.